Professional tasters serve a critical role in the industry, as their analysis helps determine an olive oil’s grade. The IOC is the only organization that certifies and monitors the performance of olive oil sensory panels around the world. Because sensory analysis is subjective by nature (consider how some people deplore spicy foods while others can’t get enough…), certified panel scores reflect a compilation of the panel’s results rather than an individual’s score. Detailed methods describe the condition of the tasting environment, sample preparation and tasting tools and even a list of rules tasters must follow such as no coffee, eating or smoking before sessions. Every effort is made to minimize bias and train the tasters to be objective in their work. Detailed information on IOC organoleptic assessment can be found on its website here. Fruity - Involves both aroma and taste, often described in terms of fresh, green, ripe, and mature. Bitter - A sensation perceived on the tongue, especially the sides. Pungent - A biting sensation that can be perceived in the whole mouth, but is most noticeable in the throat. Tasters swallow a bit of oil to fully experience the pungency. Preference can emerge especially where bitterness and pungency are concerned but these are considered positive attributes. From a quality and marketability perspective, the balance of these positive attributes is a key consideration. Fusty/Muddy Sediment - Occurs when olives are piled or stored improperly and have started to ferment. Musty/Humid/Earthy - Occurs due to humid storage conditions or from muddy, unwashed olives that lead to fungi or yeast development. Winey/Vinegary/Acid/Sour - Occurs when pressing mats are not clean and olives have fermented and formed acetic acid, ethyl acetate and ethanol. Gives a wine or vinegar taste to the oil. Rancid - occurs when the oil is oxidized. This can happen due to prolonged exposure to heat, light or air, and will occur naturally over lengths of time. Frostbitten Olives (Wet Wood) - Occurs when olives on the tree were injured by frost. To be deemed extra virgin, the oil must not have any defects and must have a median fruity score greater than zero. Given that the range of flavors is so broad, it is important to remember a "different" taste is not necessarily "bad." Sensory perception is highly influenced by personal history and familiarity and professional tasters need to become adept at naming specific sensations so they avoid mistaking a new taste for a defect. Panelists need to practice and be exposed to oils from a broad range of regions, olive varieties and times of harvest. This is one reason the IOC requires certified sensory panels to successfully complete ring-tests using pre-identified oils each year in order to maintain the panel's certification. You'll want to consider both the aromas and the flavor sensations of each oil. Color is not an indication of quality, although it can influence a taster's perception. 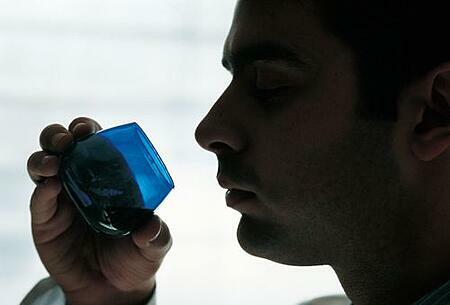 Professionals use blue-tinted glasses to remove any bias based on color. Warm the oil by cupping your hands around and over the top of the glass and slowly rotate it so the oil sticks all around the sides. Remove your hand from the top of the glass and put your nose up close, inhaling to catch the aromas. Think about what you smell – is it green, ripe, earthy, mature, fruity? If you want to, jot down your initial perceptions so you can refer back to them as you compare oils. Now, you taste! Sip enough oil to hold in your mouth and let the flavors cover your tongue. Make some noise by slowly sucking in some air, which will help release the flavors in the oil. What notes do you catch – Apple? Tomato? Herbs? Citrus? Nutty? Do you feel bitterness on your tongue? Pungency in the back of your throat? Think about the level of intensity of each sensation – are they balanced or does one dominate? Again, jot down some notes so you can look back and compare later. Cleanse your palate before moving on to the next oil. Sparkling or still water and slices of apple, such as Granny Smith, work well to get you ready for the next sample. Once you’ve had your fill of EVOO shots, you can have some real fun by working on pairing different oils with different foods. You'll be amazed at the variety and results!